Smith|doorstop’s Very Selected concept is a nifty one: twenty poems, perfect-bound, in a sleek cover; just big enough to contain the essence of a lifetime’s writing—the sort of thing that would be good to sell at a reading, or post to a friend for the cost of a first class stamp. Not really a Greatest Hits or even a Very Best Of, but something to keep in the glove-box to read by a street-light while waiting for…well, whatever comes next. 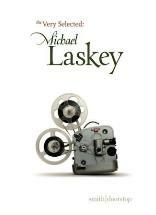 If you’re new to Michael Laskey his Very Selected makes an excellent introduction, spanning, as it does, a period from his first collection Thinking of Happiness (Peterloo, 1991) through several more recent smith|doorstop volumes. In this selection Laskey favours either compact four-line stanzas sometimes with subtle off-rhymes like before/projector, story/surely, guests/first, joke/cake, (‘Home Movies’) or poems made from one good solid chunk of free verse. The subject matter is generally the common-ground of daily life: of work, family, human frailty. We meet the author taking his youngest son to school for the first time, or picking raspberries with his mother the day before she is due for a serious operation, and we travel back in time to his parents’ wedding day, and later, imaginatively, to the moment of his conception during his father’s wartime service in the RAF. The book’s attractively designed cover sports an image of a vintage projector, and the home-movie metaphor is a good one for the selection as a whole, embracing a sense of spooling time, the ability to run things backwards, and the ambiguity of watching someone else’s life-moments, greater and lesser, re-lived in the dream-like space of a darkened room. Most readers will recognise the miniature agony of handing a child out to find his own place in the world, or the way in which an ordinary task like going to the post-office or picking fruit can be thrown into deeper perspective by events that shadow it. The challenge for the writer is that for him the simple event is often super-charged with emotional colour and the success of the re-showing relies upon his ability to imbue it with sufficient universality for the poem to hit its intended mark. Paradoxically, in this context, the apparently trivial can be the most moving. The heightened particularity of a family joke involving ‘The Clothes-peg’, for instance, shows us a couple moving from bitter self-awareness: ‘He hated the blank blue / ice of his stare and she couldn’t bear / her thin voice telling him to turn / down the TV please…’ to a laugh-out-loud acceptance as they find ever more devious ways of tagging each other’s lives with the peg he was ‘diddling with’ at the beginning. no further than your folded towel. persistently. A street lamp blinks. and, unremarked, you roll straight on. The central character, the ‘you’, who has, it appears, knocked over an un-lit cyclist is paralysed by fear into inaction and finally concealment. As in ‘The Last Swim’ there’s a disturbing feeling that the narrative here is floating on unconscious depths. So, something for everyone—even a poem in gratitude to his own quietly insistent heart. Michael Laskey has been a long-time champion of poetry in the East, with his work at the Aldeburgh Poetry Festival and on the inestimable Smiths Knoll, a little magazine with a continuing openness to new writers throughout its twenty-one-year history. For many of us, the purchase of this nicely oak-aged distillation would be a rewarding way of returning our thanks.